This lace drapery features a floral and leaf design with scalloped edges & rod pocket tops. Machine wash. Polyester; imported. Color available in White or Natural. Set of 2 Tiers. Size available in (24"L x 56"W each) or (36"L x 56"W each). 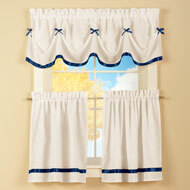 This beautiful 3piece curtain set includes a ribbontrimmed valance with dainty bow details and two tier panels with ribbon trim atop a crisp white background. Each has a rod pocket top for easy hanging. Machine wash. Polyester; imported. 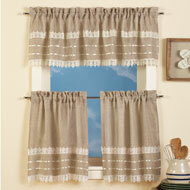 Valance is 13"L x 58"W. Tiers available in two lengths. Colors available in Burgundy, Sage or Blue. Sizes available in 24"L (24" x 28") or 36"L (36" x 28"). 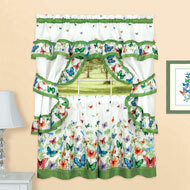 Frame your view with this beautiful curtain set that features a lovely silklike fabric printed with colorful hummingbirds and flowers. 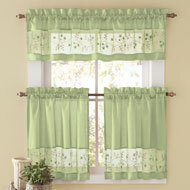 The white curtains have a green scalloped edge and a rod pocket top for easy hanging. Available in two lengths. Machine wash. Polyester; imported. 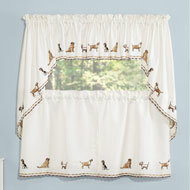 Swag valance is 56"W x 36"L. Sizes available in 24" Tiers (24" x 28") or 36" Tiers (36" x 28"). 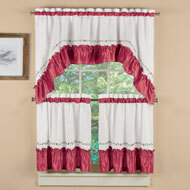 This beautifully detailed curtain set includes two tier panels, two ruffled tiebacks and swag valance with ruffled trim. 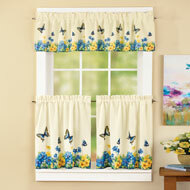 Each features a colorful border of bright butterflies with sage green trim. Available in two lengths. Imported. Machine wash. Polyester. Topper is 36"L x 57"W. Available in: 57"W x 24"L or 57"W or 36"L.
Featuring an intricate floral vine design embroidered atop a white background with coordinating ruffled border on valance and tiers, the set includes a swag valance & two tiers. Rod pocket tops for easy hanging. Machine wash. Polyester, imported. 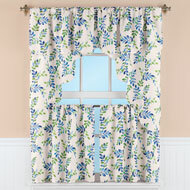 Valance is 33"L x 57"W. Color available in Blue, Burgundy or Taupe. Tier Length available in24" Tiers (24"L x 29"W) or 36" Tiers (36"L x 29"W). These lovely tiers will instantly dress your windows in designer style. The solid fabric features a lovely ribbed texture. Rod pocket tops make hanging easy. Set of 2 tiers available in your choice of 3 colors. Machine wash. Polyester; imported. Sizes available in 24"L x 54"W or 36"L x 54"W. Colors available in Red, Hunter Green, Cream, White, Navy or Sage. 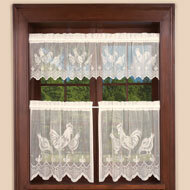 This elegant lace curtain set features a charming rooster design on a scalloped valance and two tier panels. 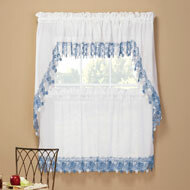 The delicate lace pattern offers privacy while letting the light shine in, and the rod pocket tops make hanging easy. Creamcolored tiers available in 2 lengths. Machine wash. Polyester; imported. 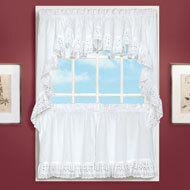 Valance is 60"W x 14"L. Tier sizes available in 24"L x 30"W or 36"L x 30"W.
A lovely way to dress your windows, these curtains have a ruffled border with eyelet details. 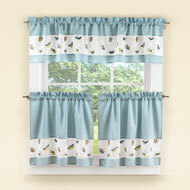 The tier set, swag set, and valance each have rod pocket tops for easy hanging. Machine wash. Polyester; imported. Valance, swags, and tiers sold separately. Choose: Ivory or White. Available in: Valance (15"L x 60"W), Two Swags (36"L x 27"W each), Two 24" Tiers (24"L x 30"W each), or Two 36" Tiers (36"L x 30"W each). 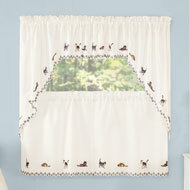 This charming curtain set has a beautifully embroidered design with cute cats or dogs and a lovely scalloped edge. 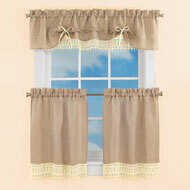 The curtains have a white background and a rod pocket top for easy hanging. Tiers available in two lengths. Machine wash. Polyester; imported. Valance, Swag & Tiers sold separately. 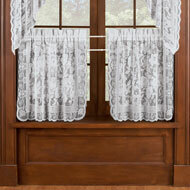 Choose Valance (12"L x 58"W), Swags (38"L x 56"W), 24" Tiers (24"L x 56"W), or 36" Tiers (36"L x 56"W). 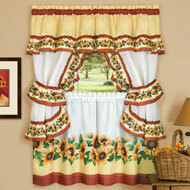 Bringing warm country charm to your home is easy with this coordinating tier and valance set. The tiers and valance feature an attractive cream ribbon design & crochet detailing that decorates a beige burlap background. Rod pocket tops. Machine wash. Polyester; imported. Tiers available in two lengths. 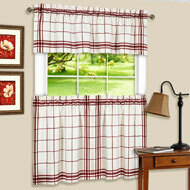 Valance is 57 1/2"W x 15 1/2"L. Tier sizes available in 30" x 24" or 30" x 36". 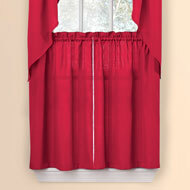 Trim a window with this beautiful, vine embroidered curtain ensemble. 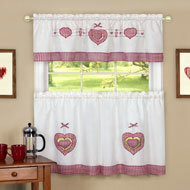 Sophisticated tierpairs or valance feature a rod pocket top and come in your choice of burgundy, green, blue or taupe. Panels and Valance sold separately. Polyester. Machine wash. 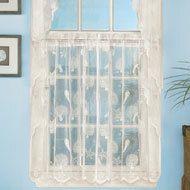 This elegant lace design will dress any window in your home with seaside style. The pretty, sheer drapery features a design of starfish, coral and seashells and has a scalloped edge and a rod pocket top for easy hanging. Machine wash. Polyester; imported. Choose White or Ivory. Set of 2 Tiers available in two lengths: 24" Tiers (24"L x 56"W) or 36" Tiers (36"L x 56"W). 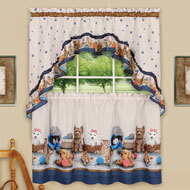 This charming drapery set features cute puppies and kittens playing with balls of pink and blue yarn. 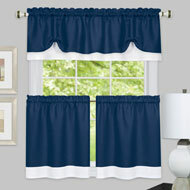 The set includes two tiers and a swag valance with an ivory background and navy blue border. Rod pocket tops make hanging easy. Swag is 30"L x 57"W. Tiers available in two lengths. Machine wash. Polyester; imported. 3Piece Set. 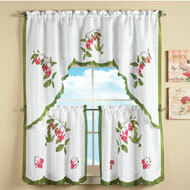 Tier sizes available in 24"L x 57"W or 36"L x 57"W.
Beautifully detailed curtain set is loaded with nostalgic charm. 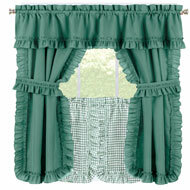 The set includes 2 tier panels, 2 ruffled tiebacks and a swag valance with cute ruffle trim. 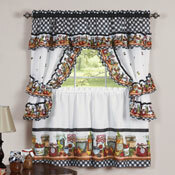 Each features a colorful border of fruit and mason jars, with blackandwhite checkered trim. Available in 2 lengths. Machine wash. Polyester. 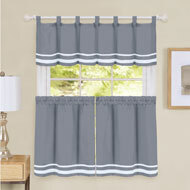 Valance is 36"L x 57"W. Tiers are 28"W x 24"L or 36"L. Available in 24"L or 36"L.
Available in 4 versatile colors, the classic curtains have a white double stripe along the bottom of the tiers and valance. 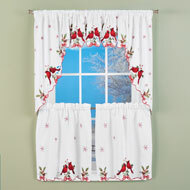 Valance features a tab top and the tiers have a rod pocket for easy hanging. Available in 2 lengths. Machine wash. Polyester; imported. Color available in Burgundy, Grey, Green or Navy. 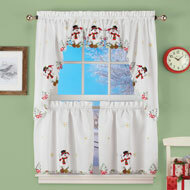 Length available in 57"W x 24"L or 57"W x 36"L.
Beautifully embroidered tier set, swag set and valance feature a charming scene of colorful snowmen and cardinals. They all have intricate cutwork, embroidered snowflakes, holly berries and pinecones atop a white background. Rod pocket top make hanging easy. Sold individually. Machine wash. Polyester; imported. 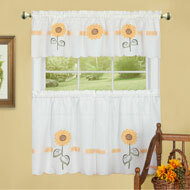 Size available in Valance (58"W x 14"L), Tier Set (24"L x 29"W or 36"L x 29"W) or Swag Set (29"W x 36"L). 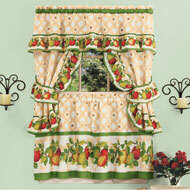 This beautifully detailed curtain set features a delightful apple theme with ruffled trim. 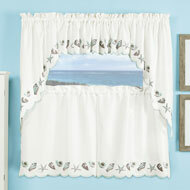 The set includes two tier panels, two ruffled tiebacks and a swag valance. Each features a colorful border of red and green apples with green trim. Rod pocket tops make hanging easy. Available in two tier lengths. Machine wash. Polyester; imported. 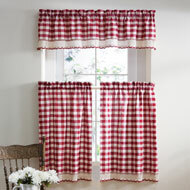 Topper is 36"L x 57"W. Available in: 57"W x 24"L or 57"W x 36"L.
These perfectly placed plaid curtain tiers come in black or burgundy to enhance any décor. Available in two sizes. Matching valance (#A2198) sold separately. Polyester/Cotton. Imported. Machine wash.  This item ships from a separate warehouse and will arrive in a separate package. Colors available in Burgundy or Black. Sizes available in 24"W x 58"L ea. or 36"W x 58"L ea.